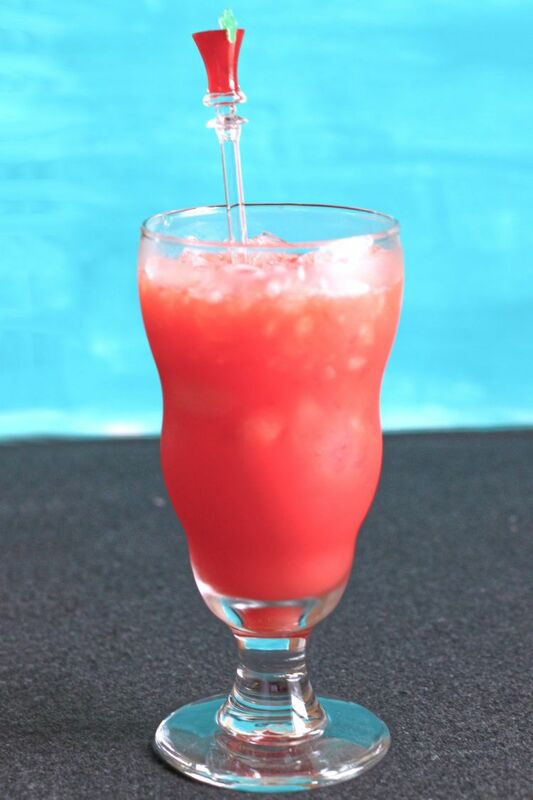 The rum-based Hurricane is a fruity drink featuring passion fruit syrup and lime. Since the fruit syrup is too think to drink without the rum, it’s not one of those cocktails you can simply leave the alcohol out of. This mocktail recipe replaces it with passion fruit and other juices. This is a really easy recipe, and you can change your fruit juices as you see fit. If you can’t get V-8 Tropical Blend, any tropical juice blend with passion fruit will do. What I feel is most important to this one is the ounce of grapefruit juice – but then I really love grapefruit juice and not everyone does. You can also leave the amaretto syrup out, but I like the added sweet almond flavor rounding out all that tart fruit. Put all the ingredients in a shaker with ice, and shake until chilled. Put some crushed ice in a hurricane glass and strain the mixture over it.